Canon promises efficient and fast monochrome output for the busiest offices with the IR-6265i copier printer. With an intelligent multifunctional design, the Canon IR-6265i monochrome laser printer aims to enhance document handling and the workflow without compromising security and environmental impact, yet it is an expensive machine, which can be pricier to upgrade. The main unit measures 1220mm tall, 770mm deep, and 645mm wide. The frame looks simple, following a universal design with the paper trays as the base, the operator panel in the centre, and the flatbed scanner on top. The colour touch panel display is the focal point of the Canon imageRUNNER ADVANCE 6265i. The main interfaces include two host USB 2.0 ports, a high-speed 2.0 port at the back, and Ethernet. Output is fast at up to 65ppm and the touch panel can be customised for easy operation. The high 7,700-sheet paper capacity of the Canon IR-ADV 6265i black and white office printer is great for bulk printing. The device itself is network-friendly, but individual accounts are kept secure. 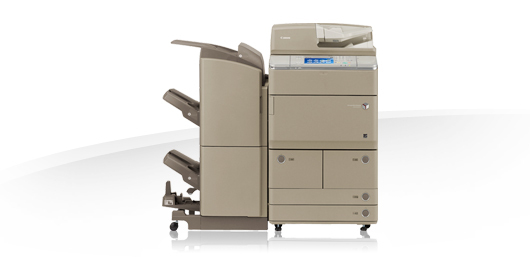 A range of finishing options is available for the Canon IR-6265i laser printer. It is possible to print directly from a USB thumb drive. The Canon IR-6265i is already an expensive multifunction printer, which can get pricier with additional accessories and hardware to make it run more efficiently. Only monochrome printing is supported, and fax is optional. The imageRUNNER ADVANCE 6265i multifunction printer requires more installation space, too, especially when the cassette drawers are open and when the paper deck, puncher units, and booklet finishers are installed on the sides. The Canon IR-6265i printer is also heavy, weighing 234Kg with the duplex colour reader unit, making it quite difficult to set up. Noise is another issue when operating.